It was another successful heart transplant today at M S Ramaiah Narayana Heart Centre in Bengaluru, which is managed by Narayana Health. The donor was a 25 year old male from Nelamangala who met with a road accident on 13th March and was taken to a local hospital and later shifted to Apollo Hospital in Bengaluru as his condition was critical. 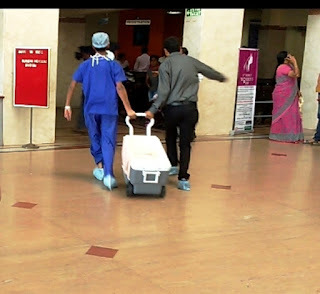 Doctors at Apollo Hospital declared him ‘brain dead’ today and the family consented for organ donation. The heart was transported to M S Ramaiah Narayana Heart Centre in Mattikere covering a distance of 19 kms in 33 minutes without a green corridor with assistance from Bengaluru Traffic Police to clear the road for the ambulance at all major traffic junctions during peak hour traffic this morning. The recipient at M S Ramaiah Narayana Heart Centre is a 31 year old male patient from Nellur in Andhra Pradesh who was suffering from Dilated Cardiomyopathy. Admitted under Dr. Nagamallesh U M, Senior Cardiologist and Heart Transplant Physician at M S Ramaiah Narayana Heart Centre, the heart failure patient was evaluated with Cardiopulmonary exercise tests and advised for heart transplant. The team of doctors from Narayana Health included Dr. Nagamallesh U M, Senior Cardiologist and Heart Transplant Physician, Dr. Julius Punnen, Senior Cardiothoracic Transplant Surgeon and Dr. Ravi Shankar Shetty, Senior Cardiothoracic Transplant Surgeon along with Dr. Ravi Nayak, Cardiac Anaesthetist and Dr. Shilpa Rudradevaru, Associate Consultant Cardiac Surgeon at M S Ramaiah Narayana Heart Centre. With this, Narayana Health group of hospitals in Bengaluru has completed 32 successful heart transplants.